5 Fun (and Effective) Couple Workouts You Can Do Together! 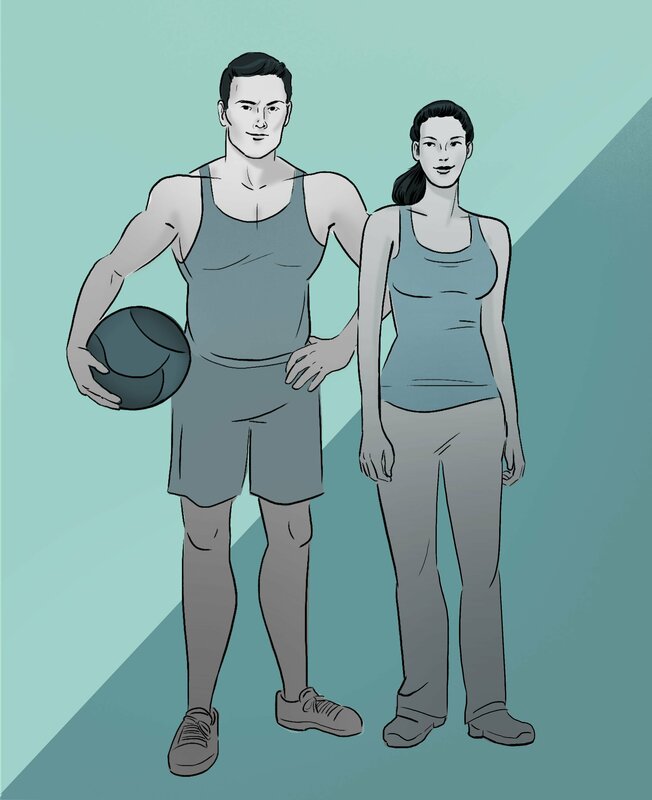 Chose your medicine ball and stand facing your partner with feet about shoulder width apart. Keeping your body in line, and your abdominal muscles engaged, pass the ball to your partner in one short, fast movement using your entire body to send the ball over. That’s one rep. So this for 15 reps, three sets. You can make this exercise more challenging my doing a squat before each pass. As you catch the ball, both squat and as you return to the starting position, then pass. Get into starting position and with toes almost touching, one partner will have the medicine ball. As you lean back, keep your abdominal muscles engaged and rest the back of your head on the flood. Then come up, crunching your abdominals, and exhaling. That’s when you’ll pass the ball. That’s one rep. Do 25 reps, 3-5 times. Get into the push-up position, facing your partner. Lower your body down towards the floor, and push upwards with your biceps, and shoulders and keep the abdominal muscles engaged. As you come back up, extend opposite arms out to touch the shoulder of your partner. That’s one rep. Do 5 reps, 3 sets. Use your partner to elevate your feet to do a tabletop plank. Just have one person get into a pushup position, and hold that plank as the other partner places their heels on the back of their partner. Allow them to get into an inverted tabletop plank. Then hold that position for 30 seconds to a minute. That’s one rep. Do three reps, then switch positions. Set a goal for how many burpees you want to get through in a minute. Then get into the starting position, and Go! You don’t want to sacrifice form for a higher amount of reps here, but you do want to win. So you can either do your reps at the same time, or simply time your partner and try to beat their best score. 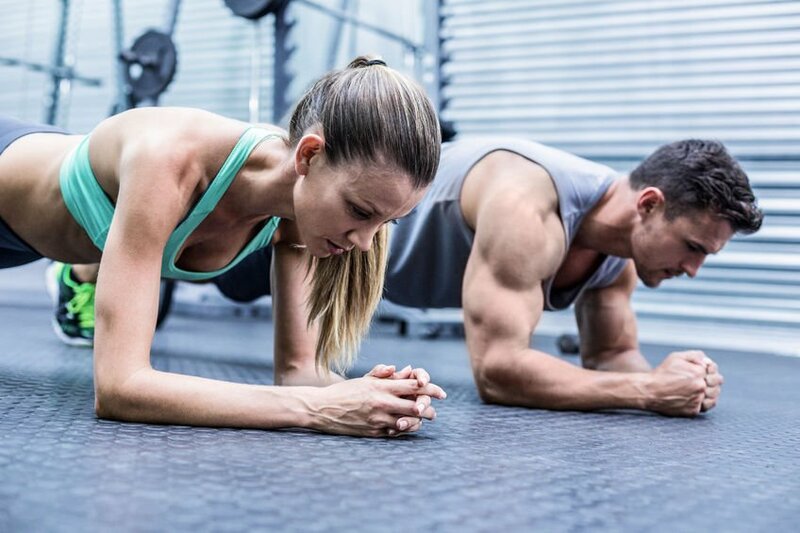 Burpees are a great workout, and having the motivation of your partner can really help get you moving! Not a fan of the gym or traditional workouts? Not a problem! There are lots of ways you and your partner can reach your fitness goals without stepping foot into a gym. Here are some alternative couples exercise activities you can experiment with. See if any of them float your boat! Going for a hike is a low-maintenance, inexpensive way to get your blood pumping. Plus you get the benefit of spending some time outdoors exploring nature. You’ll get the best exercise on steep trails — they’re great for your glutes, quadriceps, hamstrings, and calves. And while it’s certainly enjoyable to stroll on your hike — keeping up a good pace will ensure you get some cardiovascular benefit out of it. Ready to hit the rapids? An afternoon kayaking will work your arms, chest, shoulders, back, and abs. And it can be done in nearly any natural body of water — river, lake, and sea kayaking are all great options for an out-of-the-box couples workout. This is one of the most fun couples workouts out there. Salsa dancing will give you great cardio exercise while also working out the calves, hips, and core. Plus it means you can combine date night with workout night! Doing a couple workout, be it with your friend, kid or partner, is double the fun. Want more bang for your buck with an exercise routine? Add an element of competition to your partner workouts and you’ll get even better results, a new study shows. The hardest thing to do sometimes is to drag yourself through another workout. Having a partner there with you can help you do exercise you just wouldn’t be able to do alone. And you’ll have someone there with you to laugh with and see your progress. Having a workout buddy is one way to keep yourself focused on your goal, and a great way to achieve them. If you have to be accountable to someone else, you are much more likely to follow through. So, get someone else involved in your healthy lifestyle, and tell them about your goals. They might just help you reach the finish line!